With this Sunglasses Emoji Costume, bring a smile to everyone's face! Be the coolest emoji at the next costume party. If you love to text and make people smile, then this is the perfect costume for you. 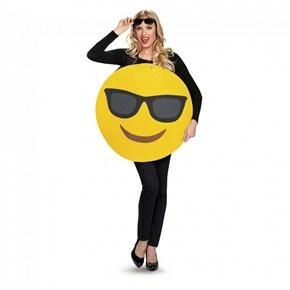 Brighten everyone's day in this sunglasses emoji adult costume! Gather some friends to form a texting and emoji filled group costume idea. This emoticon costume features a foam overlay design, and comes in one adult size. Both men and women can look cool in this costume. Note: Sunglasses, shirt and pants are not included. Availability: The Adult Sunglasses Emoticon Costume ships in approximately 1 business day.